Clavicle fractures account for 4—10% of all adult fractures, and 35—45% of all fractures in the shoulder girdle; most occur as the result of force applied to the point of the shoulder. 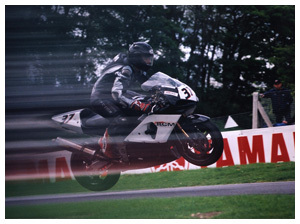 There has been an increase in leisure sports associated with appreciable risks of clavicle fracture such as horse riding, quad bikes, mountain biking and motor cycle racing / track days (personal experience) Fig 1. 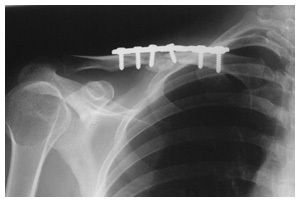 The majority of clavicle fractures may be safely and effectively treated non-operatively by use of a broad arm sling to support the upper limb (not a collar & cuff which is designed to apply traction to the shoulder) whilst union occurs with some shortening and prominence of the fracture site. Absolute indications for urgent surgical fixation (open fractures, multiple injuries, associated neurovascular injury etc) are relatively uncommon. 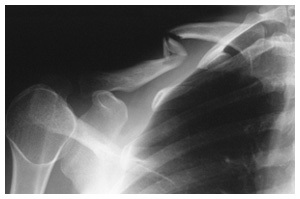 There are certain fracture patterns associated with an increased risk of non-union, and those in which malunion is associated with long term problems of shoulder weakness, pain and brachial plexus irritation (Hill), Recent studies suggest more than 1cm of displacement or 2cm of overlap of the fracture ends, particularly in high energy injuries (McKee). We offer early open reduction and internal fixation to these patients, an approach which has been shown to result in improved functional outcome and a lower rate of non-union/malunion compared to non-operative treatment (Canadian Orthopaedic Trauma Society), although it must be remembered that any operation does carry small risks, including that of infection. Surgery is usually carried out as a Day Case (ie no overnight stay in hospital) under a combination of general anaesthesia and regional block. The incision lies obliquely across the middle of the clavicle, approximately 8cm in length, and gives us access to the fracture site with fixation using a specifically designed precontoured clavicle plate (Acumed, Ostek Ltd, Andover UK) Fig 2. We often use artificial bone graft substitute which stimulates fracture union without the morbidity (medical speak for pain, scarring etc!) of harvesting the patient’s own bone from the hip. We advise a sling for 1—2 weeks, and to avoid lifting anything heavier than a pint until there is radiographic evidence of fracture union (usually 6—8 weeks). Most patients are able to stop oral analgesics at about one week post op.